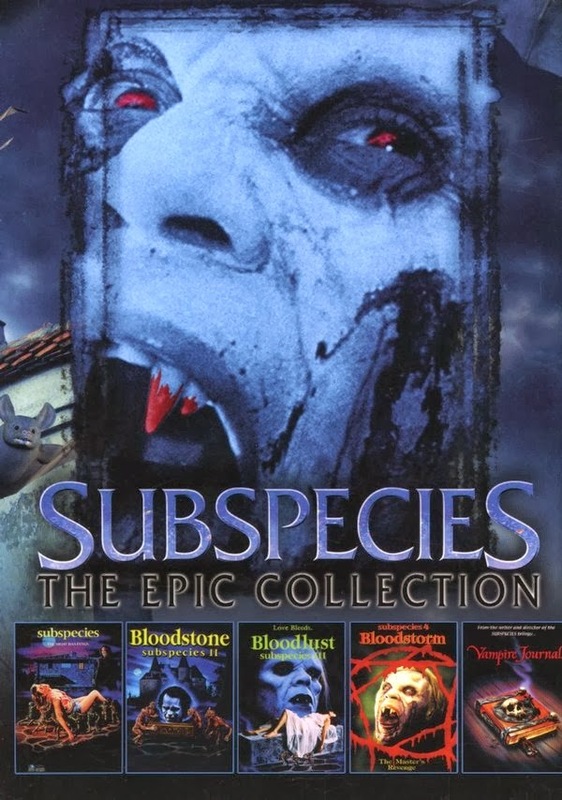 I remember seeing the first Subspecies movie while in grad school. It was great fun even if it wasn't very good. What set it apart from other Dracula-related vampire movies was this one actually was shot in Romania, which I felt gave it an air of authenticity. Or at least atmosphere. While no big now, back then the Iron Curtain was still recently fallen and growing up in the midst of the 80s and nuclear war fear it was a big deal. The other interesting twist to this movie is the stop-motion animation of Radu's minions. I always felt I Was watching two different movies with this. One was a vampire movie about a family of vampires and the other was a movie about these puppets from the same folks that gave us Puppet Master. I liked the little dudes, but they seemed under used or at best ill used. Subspecies 2 came along and there were some cast changes, but we still got Anders Hove as the evil Radu. The myths are turned up a bit, but I always felt it was half the movie it should have been. By the end I found out why. Subspecies 3 continued the story of Michelle, Radu and the Bloodstone. Except I never got to see the third movie till just this past weekend. Subspecies 3 continues right where #2 left of. All three movies when watched as the proper trilogy are more enjoyable. I did rewatch #1 and #2 since they came on the same DVD set with #3. There are a lot of call backs to the old Nosferatu movie and Radu and Michelle are no Edward and Bella. Michelle even kills a few people even though she obviously doesn't want too. Radu is just evil through out the whole thing and it is nice to know that someone out there still remembers that vampires are supposed to be monsters. Taken as a Trilogy, Subspecies is not a bad time. There is a Subspecies 4 as well. This one ties in with another movie from Full Moon, Vampire Journals, not to be confused with The Vampire Diaries. As myth building it is fun, but there is precious little of Michelle in this one. There are interesting twists on the nature of Michelle's and Radu's love/hate relationship. Michelle does hate Radu, but she needs him and she is becoming more like him. Radu on the other hand loves Michelle. So much so that he kills his entire family to have her. Vampire love is fucked up. Vampire Journals is not a sequel to Subspecies, but it is a spin off. I didn't enjoy it as much, and you don't need to watch it to enjoy Subspecies 4, but it helps. The first two movies had an undue influence on my then Gothic Earth game. I included both Radu and Stephan as sons of Dracula in my game. I also had a few Daughters thrown in for good measure. So for this weekend that in 5 with 3 new. My wife wants to know if I am vampired out yet.